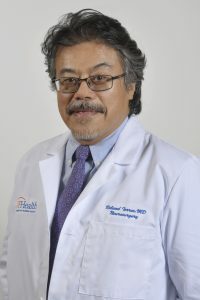 Roland Torres, MD, is an associate professor in the Department of Neurosurgery at the University of Florida College of Medicine. Dr. Torres earned his doctor of medicine degree from Universidad Central del Este, San Pedro de Marcoris in the Dominican Republic. He completed his general surgery resident at Columbia University in New York, New York, followed by a neurosurgery residency at the University of California, Davis, School of Medicine in Sacramento. He then went on to complete fellowships in neurosurgical oncology at the University of California, Davis, School of Medicine and complex spine at University of California in Los Angeles. Before joining UF, he was the director of neurotrauma at Stanford University and the University of Miami. Dr. Torres currently practices at the UF Health Neurosurgery program at Halifax Health and focuses on neurotrauma, neuro-oncology and spinal surgery.